Jacques-Yves Cousteau AC (French: [ʒak iv kusto]; 11 June 1910 – 25 June 1997) was a French naval officer, explorer, conservationist, filmmaker, innovator, scientist, photographer, author and researcher who studied the sea and all forms of life in water. He co-developed the Aqua-lung, pioneered marine conservation and was a member of the Académie française. 4, Jean-Michel, Philippe Cousteau, Diane, and Pierre-Yves. Cousteau described his underwater world research in a series of books, perhaps the most successful being his first book, The Silent World: A Story of Undersea Discovery and Adventure, published in 1953. Cousteau also directed films, most notably the documentary adaptation of the book, The Silent World, which won a Palme d'or at the 1956 Cannes Film Festival. He remained the only person to win a Palme d'Or for a documentary film, until Michael Moore won the award in 2004 for Fahrenheit 9/11. the old phrase has a literal meaning: We are all in the same boat." Cousteau was born on 11 June 1910, in Saint-André-de-Cubzac, Gironde, France, to Daniel and Élisabeth Cousteau. He had one brother, Pierre-Antoine. Cousteau completed his preparatory studies at the Collège Stanislas in Paris. In 1930, he entered the École Navale and graduated as a gunnery officer. After an automobile accident cut short his career in naval aviation, Cousteau indulged his interest in the sea. The accident caused him to break both his arms and could have even killed him. This caused Cousteau to have to change his plans in becoming a naval pilot, but it eventually worked out because of his passion for the ocean. In Toulon, where he was serving on the Condorcet, Cousteau carried out his first underwater experiments, thanks to his friend Philippe Tailliez who in 1936 lent him some Fernez underwater goggles, predecessors of modern swimming goggles. Cousteau also belonged to the information service of the French Navy, and was sent on missions to Shanghai and Japan (1935–1938) and in the USSR (1939). On 12 July 1937 he married Simone Melchior, with whom he had two sons, Jean-Michel (born 1938) and Philippe (1940–1979). His sons took part in the adventures of the Calypso. In 1991, one year after his wife Simone's death from cancer, he married Francine Triplet. They already had a daughter Diane Cousteau (born 1980) and a son, Pierre-Yves Cousteau (born 1982), born during Cousteau's marriage to his first wife. The years of World War II were decisive for the history of diving. After the armistice of 1940, the family of Simone and Jacques-Yves Cousteau took refuge in Megève, where he became a friend of the Ichac family who also lived there. Jacques-Yves Cousteau and Marcel Ichac shared the same desire to reveal to the general public unknown and inaccessible places — for Cousteau the underwater world and for Ichac the high mountains. The two neighbors took the first ex-aequo prize of the Congress of Documentary Film in 1943, for the first French underwater film: Par dix-huit mètres de fond (18 meters deep), made without breathing apparatus the previous year in the Embiez islands (Var) with Philippe Tailliez and Frédéric Dumas, using a depth-pressure-proof camera case developed by mechanical engineer Léon Vèche (engineer of Arts and Métiers and the Naval College). In 1943, they made the film Épaves (Shipwrecks), in which they used two of the very first Aqua-Lung prototypes. These prototypes were made in Boulogne-Billancourt by the Air Liquide company, following instructions from Cousteau and Émile Gagnan. When making Épaves, Cousteau could not find the necessary blank reels of movie film, but had to buy hundreds of small still camera film reels the same width, intended for a make of child's camera, and cemented them together to make long reels. Having kept bonds with the English speakers (he spent part of his childhood in the United States and usually spoke English) and with French soldiers in North Africa (under Admiral Lemonnier), Jacques-Yves Cousteau (whose villa "Baobab" at Sanary (Var) was opposite Admiral Darlan's villa "Reine"), helped the French Navy to join again with the Allies; he assembled a commando operation against the Italian espionage services in France, and received several military decorations for his deeds. At that time, he kept his distance from his brother Pierre-Antoine Cousteau, a "pen anti-semite" who wrote the collaborationist newspaper Je suis partout (I am everywhere) and who received the death sentence in 1946. However, this was later commuted to a life sentence, and Pierre-Antoine was released in 1954. During the 1940s, Cousteau is credited with improving the aqua-lung design which gave birth to the open-circuit scuba technology used today. According to his first book, The Silent World: A Story of Undersea Discovery and Adventure (1953), Cousteau started diving with Fernez goggles in 1936, and in 1939 used the self-contained underwater breathing apparatus invented in 1926 by Commander Yves le Prieur. Cousteau was not satisfied with the length of time he could spend underwater with the Le Prieur apparatus so he improved it to extend underwater duration by adding a demand regulator, invented in 1942 by Émile Gagnan. In 1943 Cousteau tried out the first prototype aqua-lung which finally made extended underwater exploration possible. In 1946, Cousteau and Tailliez showed the film Épaves ("Shipwrecks") to Admiral Lemonnier, who gave them the responsibility of setting up the Groupement de Recherches Sous-marines (GRS) (Underwater Research Group) of the French Navy in Toulon. A little later it became the GERS (Groupe d'Études et de Recherches Sous-Marines, = Underwater Studies and Research Group), then the COMISMER ("COMmandement des Interventions Sous la MER", = "Undersea Interventions Command"), and finally more recently the CEPHISMER. In 1947, Chief Petty Officer Maurice Fargues became the first diver to die using an aqualung, while attempting a new depth record with the GERS near Toulon. In 1948, between missions of mine clearance, underwater exploration and technological and physiological tests, Cousteau undertook a first campaign in the Mediterranean on board the sloop Élie Monnier, with Philippe Tailliez, Frédéric Dumas, Jean Alinat and the scenario writer Marcel Ichac. The small team also undertook the exploration of the Roman wreck of Mahdia (Tunisia). It was the first underwater archaeology operation using autonomous diving, opening the way for scientific underwater archaeology. Cousteau and Marcel Ichac brought back from there the Carnets diving film (presented and preceded with the Cannes Film Festival 1951). Cousteau and the Élie Monnier then took part in the rescue of Professor Jacques Piccard's bathyscaphe, the FNRS-2, during the 1949 expedition to Dakar. Thanks to this rescue, the French Navy was able to reuse the sphere of the bathyscaphe to construct the FNRS-3. The adventures of this period are told in the two books The Silent World (1953, by Cousteau and Dumas) and Plongées sans câble (1954, by Philippe Tailliez). In 1949, Cousteau left the French Navy. In 1950, he founded the French Oceanographic Campaigns (FOC), and leased a ship called Calypso from Thomas Loel Guinness for a symbolic one franc a year. Cousteau refitted the Calypso as a mobile laboratory for field research and as his principal vessel for diving and filming. He also carried out underwater archaeological excavations in the Mediterranean, in particular at Grand-Congloué (1952). With the publication of his first book in 1953, The Silent World, he correctly predicted the existence of the echolocation abilities of porpoises. He reported that his research vessel, the Élie Monier, was heading to the Straits of Gibraltar and noticed a group of porpoises following them. Cousteau changed course a few degrees off the optimal course to the center of the strait, and the porpoises followed for a few minutes, then diverged toward mid-channel again. It was evident that they knew where the optimal course lay, even if the humans did not. Cousteau concluded that the cetaceans had something like sonar, which was a relatively new feature on submarines. In 1954, Cousteau conducted a survey of Abu Dhabi waters on behalf of British Petroleum. Among those accompanying him was Louis Malle who made a black-and-white film of the expedition for the company. Cousteau won the Palme d'Or at the Cannes Film Festival in 1956 for The Silent World co-produced with Malle. In 1957, Cousteau took over as leader of the Oceanographic Museum of Monaco. Afterward, with the assistance of Jean Mollard, he made a "diving saucer" SP-350, an experimental underwater vehicle which could reach a depth of 350 meters. The successful experiment was quickly repeated in 1965 with two vehicles which reached 500 meters. In 1957, he was elected as director of the Oceanographical Museum of Monaco. He directed Précontinent, about the experiments of diving in saturation (long-duration immersion, houses under the sea), and was admitted to the United States National Academy of Sciences. He was involved in the creation of Confédération Mondiale des Activités Subaquatiques and served as its inaugural president from 1959 to 1973. Cousteau also took part in inventing the "SP-350 Denise Diving Saucer" in 1959 which was an invention best for exploring the ocean floor, as it allowed one to explore on solid ground. In October 1960, a large amount of radioactive waste was going to be discarded in the Mediterranean Sea by the Commissariat à l'énergie atomique (CEA). The CEA argued that the dumps were experimental in nature, and that French oceanographers such as Vsevelod Romanovsky had recommended it. Romanovsky and other French scientists, including Louis Fage and Jacques Cousteau, repudiated the claim, saying that Romanovsky had in mind a much smaller amount. The CEA claimed that there was little circulation (and hence little need for concern) at the dump site between Nice and Corsica, but French public opinion sided with the oceanographers rather than with the CEA atomic energy scientists. The CEA chief, Francis Perrin, decided to postpone the dump. Cousteau organized a publicity campaign which in less than two weeks gained wide popular support. The train carrying the waste was stopped by women and children sitting on the railway tracks, and it was sent back to its origin. 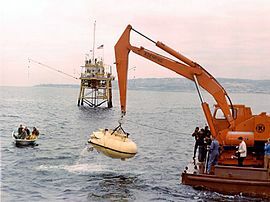 In the 1960s Cousteau was involved with a set of three projects to build underwater "villages"; the projects were named Precontinent I, Precontinent II and Precontinent III. Each ensuing project was aimed at increasing the depth at which people continuously lived under water, and were an attempt at creating an environment in which men could live and work on the sea floor. The projects are best known as Conshelf I (1962), Conshelf II (1963), and Conshelf III (1965). The names "Precontinent", and "Continental Shelf Station" (Conshelf) were used interchangeably by Cousteau. A meeting with American television companies (ABC, Métromédia, NBC) created the series The Undersea World of Jacques Cousteau, with the character of the commander in the red bonnet inherited from standard diving dress intended to give the films a "personalized adventure" style. This documentary television series ran for ten years from 1966 to 1976. A second documentary series, The Cousteau Odyssey, ran from 1977 to 1982 on public television stations. In 1970, he wrote the book The Shark: Splendid Savage of the Sea with his son Philippe. In this book, Cousteau described the oceanic whitetip shark as "the most dangerous of all sharks". In December 1972, two years after the volcano's last eruption, The Cousteau Society was filming Voyage au bout du monde on Deception Island, Antarctica, when Michel Laval, Calypso's second in command, was struck and killed by a rotor of the helicopter that was ferrying between Calypso and the island. 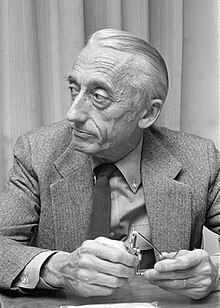 In 1973, along with his two sons and Frederick Hyman, he created the Cousteau Society for the Protection of Ocean Life, Frederick Hyman being its first President. In 1975, John Denver released the tribute song "Calypso" on his album Windsong, and on the B-side of his hit song "I'm Sorry". "Calypso" became a hit on its own and was later considered the new A-side, reaching #2 on the charts. In 1976, Cousteau located the wreck of HMHS Britannic. He also found the wreck of the French 17th-century ship-of-the-line La Therese in coastal waters of Crete. In 1977, together with Peter Scott, he received the UN International Environment prize. On 28 June 1979, while the Calypso was on an expedition to Portugal, his second son Philippe, his preferred and designated successor and with whom he had co-produced all his films since 1969, died in a PBY Catalina flying boat crash in the Tagus river near Lisbon. Cousteau was deeply affected. He called his then eldest son, the architect Jean-Michel, to his side. This collaboration lasted 14 years. From 1980 to 1981, he was a regular on the animal reality show Those Amazing Animals, along with Burgess Meredith, Priscilla Presley, and Jim Stafford. In 1980, Cousteau traveled to Canada to make two films on the Saint Lawrence River and the Great Lakes, Cries from the Deep and St. Lawrence: Stairway to the Sea. In 1985, he received the Presidential Medal of Freedom from Ronald Reagan. On 24 November 1988, he was elected to the Académie française, chair 17, succeeding Jean Delay. His official reception under the cupola took place on 22 June 1989, the response to his speech of reception being given by Bertrand Poirot-Delpech. After his death, he was replaced by Érik Orsenna on 28 May 1998. In June 1990, the composer Jean Michel Jarre paid homage to the commander by entitling his new album Waiting for Cousteau. He also composed the music for Cousteau's documentary "Palawan, the last refuge". On 2 December 1990, his wife Simone Cousteau died of cancer. In June 1991, in Paris, Jacques-Yves Cousteau remarried, to Francine Triplet, with whom he had (before this marriage) two children, Diane and Pierre-Yves. Francine Cousteau currently continues her husband's work as the head of the Cousteau Foundation and Cousteau Society. From that point, the relations between Jacques-Yves and his elder son worsened. In November 1991, Cousteau gave an interview to the UNESCO Courier, in which he stated that he was in favour of human population control and population decrease. Widely quoted on the Internet are these two paragraphs from the interview: "What should we do to eliminate suffering and disease? It's a wonderful idea but perhaps not altogether a beneficial one in the long run. If we try to implement it we may jeopardize the future of our species...It's terrible to have to say this. World population must be stabilized and to do that we must eliminate 350,000 people per day. This is so horrible to contemplate that we shouldn't even say it. But the general situation in which we are involved is lamentable". In 1992, he was invited to Rio de Janeiro, Brazil, for the United Nations' International Conference on Environment and Development, and then he became a regular consultant for the UN and the World Bank. In 1996, he sued his son who wished to open a holiday center named "Cousteau" in the Fiji Islands. On 11 January 1996, Calypso was accidentally rammed and sunk in the port of Singapore by a barge. The Calypso was refloated and towed home to France. Jacques-Yves Cousteau died of a heart attack on 25 June 1997 in Paris, two weeks after his 87th birthday. He was buried in the family vault at Saint-André-de-Cubzac, his birthplace. An homage was paid to him by the town by naming the street which runs out to the house of his birth "rue du Commandant Cousteau", where a commemorative plaque was placed. Cousteau's legacy includes more than 120 television documentaries, more than 50 books, and an environmental protection foundation with 300,000 members. Cousteau liked to call himself an "oceanographic technician." He was, in reality, a sophisticated showman, teacher, and lover of nature. His work permitted many people to explore the resources of the oceans. His work also created a new kind of scientific communication, criticized at the time by some academics. The so-called "divulgationism", a simple way of sharing scientific concepts, was soon employed in other disciplines and became one of the most important characteristics of modern television broadcasting. The Cousteau Society and its French counterpart, l'Équipe Cousteau, both of which Jacques-Yves Cousteau founded, are still active today. The Society is currently attempting to turn the original Calypso into a museum and it is raising funds to build a successor vessel, the Calypso II. 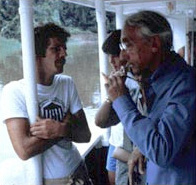 In his last years, after marrying again, Cousteau became involved in a legal battle with his son Jean-Michel over Jean-Michel licensing the Cousteau name for a South Pacific resort, resulting in Jean-Michel Cousteau being ordered by the court not to encourage confusion between his for-profit business and his father's non-profit endeavours. In 2007, the International Watch Company introduced the IWC Aquatimer Chronograph "Cousteau Divers" Special Edition. The timepiece incorporated a sliver of wood from the interior of Cousteau's Calypso research vessel. Having developed the diver's watch, IWC offered support to The Cousteau Society. The proceeds from the timepieces' sales were partially donated to the non-profit organization involved in conservation of marine life and preservation of tropical coral reefs. Though he was not particularly a religious man, Cousteau believed that the teachings of the different major religions provide valuable ideals and thoughts to protect the environment. In a Chapter entitled "The Holy Scriptures and The Environment" in the posthumous work The Human, the Orchid, and the Octopus, he is quoted as stating that "The glory of nature provides evidence that God exists". The American comedy film The Life Aquatic with Steve Zissou, directed by Wes Anderson and first released in December 2004, portrays Steve Zissou, a fictional oceanographer strongly inspired by Jacques Cousteau. The French film The Odyssey, directed by Jérôme Salle and first released in October 2016, focuses on Cousteau's life, especially regarding his relation with his first wife, Simone Melchior, and his second son, Philippe Cousteau. ^ a b c "Cousteau Society". Archived from the original on 25 January 2009. Retrieved 12 September 2013. ^ a b c d "Jacques Cousteau | French ocean explorer and engineer". Encyclopædia Britannica. Retrieved 2 March 2016. ^ "le Scaphandre Autonome". Espalion-12.com. Archived from the original on 30 October 2012. Retrieved 10 November 2012. ^ Ecott, Tim (2001). Neutral Buoyancy: Adventures in a Liquid World. New York: Atlantic Monthly Press. ISBN 0-87113-794-1. LCCN 2001018840. ^ Riffaud, C. ""La règne du scaphandre à casque", in La grande aventure des hommes sous la mer". Users.skynet.be. ISBN 2-226-03502-8. Retrieved 10 November 2012. ^ Morton, Michael Quentin (June 2015). "Calypso in the Arabian Gulf: Jacques Cousteau's Undersea Survey of 1954". Liwa. 5 (9): 3–28. Retrieved 17 August 2016. ^ "Jacques-Yves Cousteau (1959-1973)". Confédération Mondiale des Activités Subaquatiques. Retrieved 2 April 2013. ^ Hamblin, Jacob Darwin (2008). Poison in the Well: Radioactive Waste in the Oceans at the Dawn of the Nuclear Age. Piscataway, NJ: Rutgers University Press. ISBN 0813542200. Retrieved 14 December 2018. ^ "Accident kills Cousteau aide in Argentina (December 30, 1972)". Chicago Tribune. Retrieved 4 December 2016. ^ "Hero and Calypso at Deception Island 1972-73". www.palmerstation.com. Retrieved 4 December 2016. ^ Ohayon, Albert (2009). "When Cousteau Came to Canada". NFB.ca. National Film Board of Canada. Retrieved 25 October 2009. ^ "Article: Jacques-Yves Cousteau. (Interview) | AccessMyLibrary - Promoting library advocacy". AccessMyLibrary. 1 November 1991. Retrieved 10 November 2012. ^ "La "conversion" du commandant Cousteau à l'Islam". Atheisme.free.fr. Retrieved 10 November 2012. ^ Jean-Michel Cousteau (11 June 2010). "Jacques Cousteau "would be heartbroken" at our seas today". Archived from the original on 14 June 2010. Retrieved 12 September 2013. ^ "It's an Honour - Honours - Search Australian Honours". Itsanhonour.gov.au. 26 January 1990. Retrieved 10 November 2012. ^ "Diver's Watch Bearing a Piece of Cousteau's Legendary Vessel Watches Channel". Watches.infoniac.com. 27 July 2007. Retrieved 10 November 2012. ^ "32 Facts About 'The Life Aquatic with Steve Zissou'". Mental Floss. Retrieved 21 October 2016. ^ a b "Watch: First International Trailer For Jacques Cousteau Biopic 'The Odyssey' Starring Lambert Wilson & Audrey Tautou". The Playlist. Retrieved 21 October 2016. ^ a b "L'Odyssée : Lambert Wilson dans la peau de Cousteau". Le Figaro. Retrieved 21 October 2016. ^ "World Premiere of Wild Bunch-Sold 'The Odyssey' Closes San Sebastian". Variety. Retrieved 21 October 2016. ^ "Ce que le biopic sur Cousteau, "L'Odyssée", nous apprend de son côté obscur". The Huffington Post (French Edition). Retrieved 21 October 2016. Wikimedia Commons has media related to Jacques-Yves Cousteau.